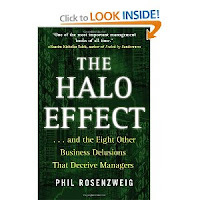 Even when studies manage to steer clear of the Halo Effect (by using objective measures, for example) or are tracked over time to reduce direction of causation confusion, they can still fail as a result of falling for the single explanation. If one adds up all of the effects that are singly attributed to superior company performance (even for studies that are done properly), a multiple of 100% of the out-performance is "explained". But the out-performance is only 100%, so how can all of these attributes add up to 10,000% for example? These attributes are all correlated! For example, companies' level of "market orientation" (as objectively defined in a study) explained 25% of out-performance, while stronger corporate social responsibility (CSR) explained 40% of the out-performance. So do these two attributes combined explain 65% of the out-performance? Probably not. (If it were, we would quickly get up above 100% by adding in other attributes.) Instead, the out-performance is likely due to company managers that institute best-practices in a range of areas, including customer orientation and CSR. When this is the case, we can't really tell which attributes are contributing and which aren't. But all are trumpeted as being single explanations for dramatic out-performance.